Passion flower, also known as passiflora, apricot vine, wild passion flower and purple passionflower, is a fast growing and stunning perennial vine in warm regions and a prolific annual in others. There are over 400 species of passionflower growing all over the world. Passionflower incarnata is native to the Midwest and Southeastern United States. Passionflower herb is used as an alternative medicine for a number of conditions including insomnia, nervous disorders, seizures and anxiety. Native Americans applied the flower to boils and consumed infusions for liver and blood health. The Mexican Aztecs used the fruit to treat nervousness and insomnia. Once the value of the plant was recognized in the Untied States, it was sent to Europe and soon became an integral part of early European medicine. The most noted use of passionflower is as a calming agent and sleep aid. Passionflower is the perfect complement to our hurried culture and can quickly take the edge off of a supercharged day. With millions of Americans suffering from chronic insomnia and a host of other sleep disorders, this pretty little herb offers help. A number of studies confirm this flower’s sedative and anxiolytic effects. Passionflower is also a potent antioxidant and contains eight known antioxidants that provide protection and defense from free radicals. Of particular benefit is the antioxidant quercetin which has been shown to be a powerful anti-inflammatory and also has anti- cancer properties. The plant is also a rich source of fatty acids, phytosterols and alkaloids. 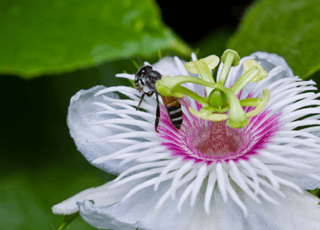 Passionflower is both edible and medicinal. It is often mixed with valerian, lemon balm, skullcap and chamomile for a relaxing tea. Alone, as a tea, it is mild and aromatic with an unusual taste and a pale green color. It makes an equally enjoyable iced or hot tea. The flowers are also edible and can be used in salads, adding texture and color. The fruit makes delicious jellies, jams or even wine. As with any herbal treatment, it is always best to speak with a health care practitioner before using. Next articleIs This Type of Yogurt Bad For You? Hey Buddy!, I found this information for you: "A Pretty Passionate and Potent Herb That Blows Away Stress". Here is the website link: https://www.thealternativedaily.com/a-pretty-passionate-and-potent-herb-that-blows-away-stress/. Thank you.